Michelin Chief Executive Officer Jean-Dominique Senard, a frontrunner to replace Carlos Ghosn atop Renault SA, has passed one of the tests required for the job: Support of the French state. Senard, 65, has boosted profitability during his seven years at the helm of the French tiremaker, winning the favor of the government -- Renault’s biggest shareholder. The carmaker said Thursday it will seek new governance, almost two months after Chairman and CEO Ghosn was detained in Japan for alleged financial misdeeds. On Wednesday, French Finance Minister Bruno Le Maire called Senard “a great industrialist,” in a television interview. An executive at alliance partner Nissan Motor Co. expressed favourable views on his possible appointment atop Renault. His auto industry experience suggests he would be capable of sustaining the Renault-Nissan alliance that was strained by Ghosn’s arrest, the person said, asking not to be identified because the exchanges were private. “Senard would bring long-running expertise in dealing with different automakers,’’ following his tenure at Michelin, said Bernard Jullien, an economist and automotive industry consultant. If appointed, Senard could temporarily hold both the CEO and chairman positions until Renault holds a shareholder meeting. He could also become chairman, with current interim CEO Thierry Bollore -- who started his career at Michelin -- taking a more permanent role. According to Renault’s current statutes, the age limit for the chairman is 72, and for the CEO is 65. Other candidates will also be examined by Renault’s governance committee, possibly before the end of this week, people familiar with the matter said. Any final management change may be delayed until Renault’s annual meeting in June when the new governance could be approved by investors. A spokesman for Renault declined to comment. Senard didn’t return a request for comment. A Nissan spokesman said the company isn’t in a position to speculate or comment on potential decisions by its alliance partner, Renault. Senard’s time at Cie Generale des Etablissements Michelin, the French tiremaker that also owns the eponymous restaurant guide, is coming to an end. He previously announced plans to step down in May after declining to seek another mandate. Should he move to Renault, he would bring a big change of style. Cordial and soft-spoken -- some would say austere -- Senard contrasts with Ghosn and his bustling, bigger-than-life persona. French President Emmanuel Macron called Michelin a “model company” last year, praising it for its frequent dialogue with unions. The government assigned Senard to write a report on how French companies can contribute to the general welfare. The document concluded that companies shouldn’t be accountable only to their shareholders, but also the common good. It advocated putting more employee representatives on company boards. Laurent Berger, head of the CFDT union, has told French media that Senard had “a real policy of social dialogue and is willing to listen to others.” Since taking the helm, Senard improved profitability amid rising competition from lower-cost rivals, partly by expanding Michelin’s premium product lines. The executive earned 3.8 million euros ($4.3 million) at Michelin in 2017, according to the annual report. That’s a far cry from Ghosn’s compensation, which averaged about $15 million annually in the past five years at Renault and Nissan. 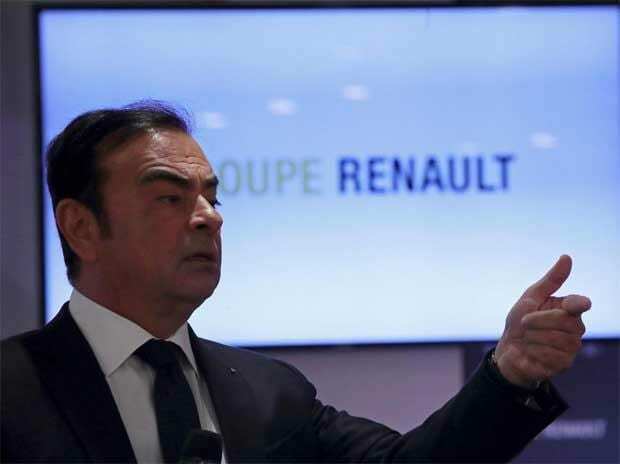 Until now, Renault and the French state had cited the principle of presumed innocence in backing Ghosn, even as Nissan and smaller alliance partner Mitsubishi Motors Corp. ousted him as chairman. That changed Wednesday, when Le Maire called for “new and durable,” governance at the carmaker, and pushed for a Renault board meeting in the next few days. The state has a 15 percent stake in Renault, along with extra voting rights and two seats on the board. Ghosn received “improper” pay from Nissan-Mitsubishi BV, a venture between Nissan and Mitsubishi, the companies said Friday as they announced the results of an internal probe. He was paid 7.8 million euros in compensation by the entity after entering into an employment contract that he didn’t discuss with the other board members -- despite a requirement to do so beforehand, the companies said. Another pressing question is who will run the Renault-Nissan alliance, a complex partnership overseen by Ghosn that shares purchasing budgets and technologies, underpinned by cross-shareholdings. Mitsubishi joined in 2016. France’s finance minister has said that the CEO of Renault should also lead the alliance, according to a bilateral agreement. Yet as Nissan seeks to exert more influence over a partnership that it perceives as unbalanced, negotiations may be needed before naming a new alliance boss. Tensions are at an all-time high between the Franco-Japanese partners, insiders have said. Yet many executives emphasize the need to continue the union at a time of costly changes in the auto industry, including the decline of diesel cars, stricter pollution standards and enormous investment in electric and autonomous vehicles.